My name is Grant, and I’m 13. My favorite ice cream is chocolate. 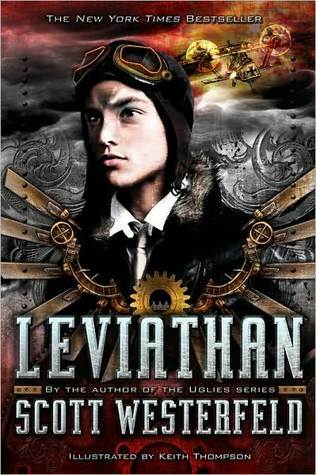 I just finished reading Leviathan by Scott Westerfeld and I love steampunk. Um, I can't do this in one word...robots vs. man-made animals. I really liked when Alek meets Deryn during a dramatic scene. Alek tries to help Deryn but then Deryn sends dogs after Alek. It's not a great way to start a relationship. I think I would have had a similar reaction to Alek's but his problem is much bigger than I'd ever want to have. This book bends the rules of nature. I could recognize our world in this story but the differences are creative and fun. It's cool. It is a good mix of World War I and steampunk. Yes! I already have Book 2, Behemoth, ready to go. No. This book seems very unique to me. It tells an alternate history by mixing the natural world with mechanics and machinery. If you could ask the author one question about this book what would it be? How much research of history did you have to do to make the book seem realistic? In answer to Grant's question, Scott Westerfeld talked a bit about his research process in this interview with Tor. A big thank you to Grant for sharing Leviathan with us!